Every year, New York City residents throw away 200,000 tons, and businesses throw away 8 million tons, of clothing. Cooper Hewitt, Smithsonian Design Museum’s exhibition “Scraps: Fashion, Textiles, and Creative Reuse” shows creative, alternative approaches to confronting textile waste, focusing on the work of three designers who put sustainability at the heart of the design process: Luisa Cevese, founder of Riedzioni in Milan; Christina Kim, founder of dosa inc., in Los Angeles; and Reiko Sudo, managing director at NUNO in Tokyo. The three designers featured in “Scraps” employ innovative and sophisticated reuse of textile materials and resources while engaging in preserving local craft traditions. 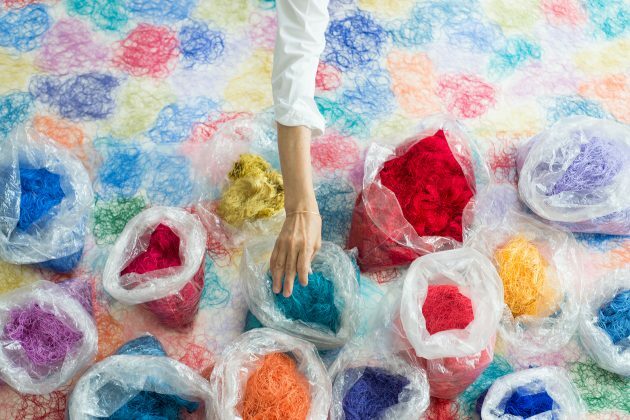 Through more than 40 works, the exhibition explores key facets of sustainability, such as efficiently using materials and resources, preserving local craft traditions and integrating new technologies in the recycling process. Learn more about “Scraps” and see the exhibition’s objects on Cooper Hewitt’s website and exhibition blog at https://www.cooperhewitt.org/channel/scraps/.